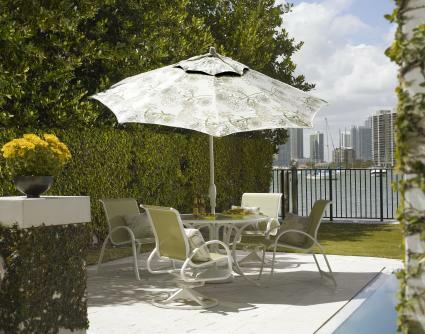 The Value Market Umbrellas with auto tilt, feature excellent quality at an attractive price. Available to order in 7 1/2 ft., 9 ft. or 11 ft. sizes. In addition, you can order these Value Umbrellas in any Telescope fabric suitable for use on market umbrellas. Available Frame Finishes to Choose from When Ordering: Value White Frame (coordinates with White, Snow or Warm Gray finishes), Value Pewter Frame (coordinates with Graphite and Silver finishes), Value Bronze Frame (coordinates with Kona and Beachwood finishes), Value Black Frame (coordinates with black finish), or Value Mocha Frame (coordinates with Desert finish). Pricing depends upon fabric grade. You may want to come in and browse our fabric collection.